8 names you know, R.I.P. Popular auto makes, magazine publishers and retailers were among the businesses laid to rest in 2009. Here's a list of 8 familiar names you won't see in the future.  What's in a new logo? 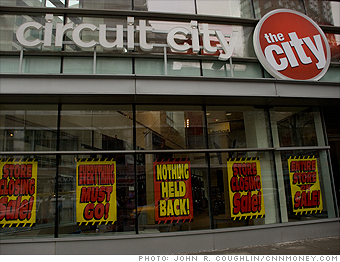 Circuit City became one of the largest retailers to go out of business this year, after the 60-year old electronics chain declared bankruptcy at the end of 2008. The fall of Circuit City was mainly a result of the prodigious belt tightening that took place in households across America during the depths of the recession. But the company's demise had its roots in poor management decisions dating back several years. In 2007, for example, Circuit City laid off several thousand experienced sales people and replaced them with cheaper but less knowledgeable workers. That took a toll on customer loyalty, and ultimately benefited rivals like Best Buy. Circuit City also found itself in the unfortunate position of having to compete with Wal-Mart as the world's largest retailer aggressively moved into the electronics market with low prices. Meanwhile, the Circuit City brand has been resurrected online. Systemax Inc., a direct seller of consumer electronics, acquired the trademark and Internet domain name for Circuit City in April.